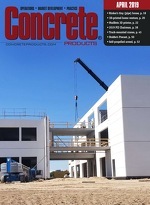 Sources: National Concrete Masonry Association, Herndon, Va. The 2017 NCMA SRW Sales Survey of U.S. and Canadian hardscape producers indicates year-over-year segmental retaining wall shipment gains of 3 percent and 6.5 percent, respectively, for 2016 and 2015. Now in its second year, the survey reflects data from 39 SRW producers or licensors spanning 178 plant locations. Data was solicited in 8- and 6-in. height, ‘DOT quality’, ‘boundary wall’ (fences or other vertical structures not retaining soil) and ‘other’ unit categories. The DOT category performed best in 2016, with a 20 percent volume increase over the prior year, followed by moderate 8-in. high SRW and boundary wall unit growth. The complete 2017 NCMA SRW Sales Survey is available for $99 (NCMA members) and $1,500 (nonmembers), and can obtained from the association, 703/713-1900, www.ncma.org.